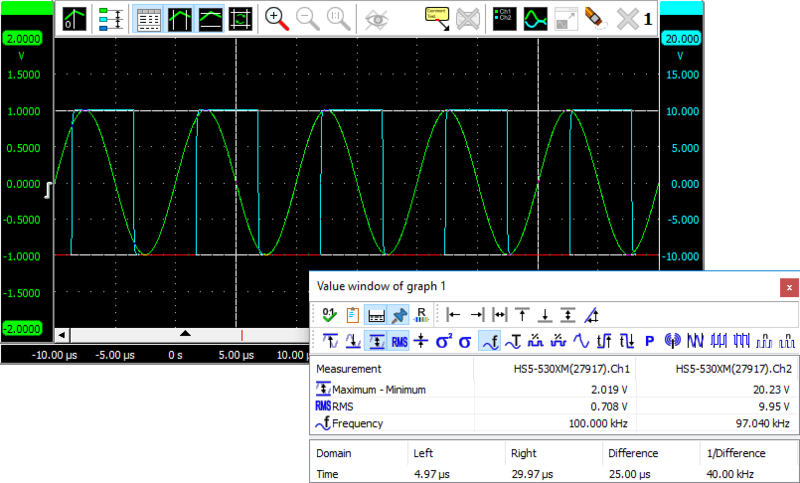 The Multi Channel oscilloscope software allows you to create and arrange graphs the way you want. New graphs can be created on the main screen of the measurement software and can be moved to a separate window outside the main screen. When a new graph is created, the user can fully control the position of the graph, as well as the size. By arranging the graphs to the user's liking, the user can focus more on the measurements at hand, rather than having to locate the graph with the desired information all the time. The graphs can contain scope images, spectrum analyzer images and data logger images. Read here to learn how to display data in a graph. To change the offset setting of an axis, simply grab the axis and drag it to the required position, see animation 1 for an example. To change the gain setting, grab one of the end bars of an axis and drag it to the preferred position, see animation 2 for an example. It is also possible to adjust the offset and gain with the mouse wheel: when the mouse pointer is above the axis and the wheel is turned, the offset is adjusted. When the Ctrl key is pressed during the turning of the wheel, the gain is adjusted instead. Automatic Each axis uses a whole number of divisions and axes are positioned without overlap. Axes can get different zoom factors. Automatic with overlap Each axis uses a whole number of divisions and axes are positioned with overlap. Axes can get different zoom factors. 1:N All axes are evenly divided and they are positioned without overlap. All axes get the same zoom factor. 1:N with overlap All axes are evenly divided and they are positioned with 50% overlap. All axes get the same zoom factor. 1:M Each axis uses a whole number of divisions and axes are positioned without overlap. All axes get the same zoom factor. 1:M with overlap Each axis uses a whole number of divisions and axes are positioned with overlap. All axes get the same zoom factor. Linear: The data of the axis is displayed on a linear scale. Logarithmic: The data of the axis is displayed on a logarithmic scale. 0 dB corresponds to 1 V.
Setting the axis type can be done by right clicking the axis and selecting "Axis type" from the menu that pops up. When a graph shows several signals, it may be convenient to temporarily hide one or more lines, for a better view on the other signal lines. When a signal is hidden from the graph, it remains being measured and all other settings remain unchanged. To hide a line, or show a hidden line again, right-click the axis of the line and select "Line visible" from the menu that pops up. When performing a streaming measurement with a high sample rate, hiding lines during the measurement will reduce the load on the computer. This may reduce the chance that the computer cannot keep up with the data stream, causing the stream to be aborted. When the measurement is ready, the line(s) can be made visible again, for signal analysis. The width of the scroll bar represents the total measured record, the width of the slider represents the visible part of the record. To change the record view offset, grab the slider and drag it to the preferred position (animation 3) or press the buttons at the sides of the scroll bar. To change the record view gain, drag one of the edges of the slider either to the left or the right and watch the signal change corresponding to the slider width (animation 4). It is also possible to adjust the offset and gain with the mouse wheel: when the mouse pointer is above the scroll bar and the wheel is turned, the offset is adjusted. When the Ctrl key is pressed during the turning of the wheel, the gain is adjusted instead. Double-clicking the slider, clicking the Reset zoom button or pressing the hotkey T will return the time base to its default unzoomed state. When a time domain graph contains a Data collector, it is possible, while the Data collector is being filled, to zoom in on the latest data and have the graph automatically keep the latest data visible. Choose the appropriate zoom factor in the graph and right-click the time base axis and select Follow source from the popup menu. This will show a sub menu with the possible sources to follow and an option not to follow a source. Linear: The spectrum is shown on a linear frequency scale. The frequency axis runs from 0 to the maximum frequency and has a linear division. Logarithmic: The spectrum is shown on a Logarithmic frequency scale. The frequency axis runs from the minimum frequency to the maximum frequency and has a logarithmic division. Setting the axis type can be done by clicking the linear/logarithmic axis toolbutton / or by right clicking the axis and selecting "Axis type" from the menu that pops up. Seconds: All labels along the axis display the time in seconds. Days, hours, minutes and seconds: The labels along the axis display the time in seconds. When the label time exceeds 1 minute, the time for that label will be displayed in minutes and seconds. When the label time exceeds 1 hour, the time for that label will be displayed in hours, minutes and seconds. When the label time exceeds 1 day, the time for that label will be displayed in days, hours, minutes and seconds. Date and time: The labels along the axis display the time in absolute date and time. To set the label style, right-click the horizontal axis and select the menu item Label style. If you want to view a small section of your measurement simply drag a rectangle using the mouse at the section you want to see in detail, see animation 5. Multiple mouse zooming operations are remembered and it is possible to unzoom with the Undo zoom button or hotkey U. Fully resetting all horizontal and vertical axs is done with the Reset zoom button . To zoom in horizontal direction only and leave the vertical zoom factor unchanged, press the Ctrl key and select a zooming area with the mouse. To zoom in vertical direction only and leave the horizontal zoom factor unchanged, press the Shift key and select a zooming area with the mouse. Creating multiple graphs can easily be done by using the Create new graph quick function . A second way is right-clicking on the graph area and select Make new graph. Then drag a rectangle at the position where you like to have a new graph. The rectangle may be dragged over multiple existing graphs. When more than one graph is available, one graph becomes the active graph, indicated by a blue border around the graph. Instruments, channels, sources and I/Os have actions that will add a line for that object in the active graph. The File menu contains an option to save the active graph as image. Selecting a graph as active graph is done by clicking that graph with the mouse or by using hotkey Shift + graph number. clicking Show vertical cursors in the graph's popup menu. clicking Show horizontal cursors in the graph's popup menu. The cursors can also be used to measure values of interest indicated by the cursors. These measurements include e.g. 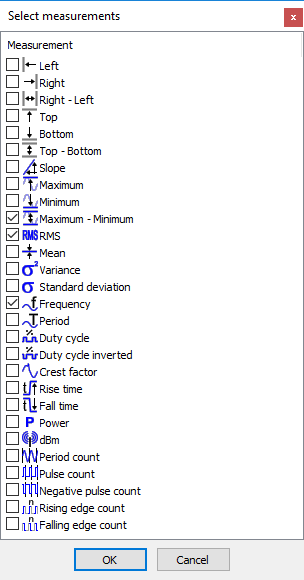 : Mininum, Maximum, Top-Bottom, RMS, Mean, Variance, Standard deviation, Frequency. Measurement results are shown in a special value window which is opened by clicking the "Value window" button ( ) on the toolbar. When the value window is opened and the vertical an/or horizontal cursors are not switched on, the required cursors will be switched on, based on the default selected measurements. Vertical cursors are waveform based, they can be positioned anywhere on the signal by dragging them with the mouse. Optionally, they can snap to sample positions, by selecting Snap vertical cursors to samples from the graph's popup menu. Two red lines in the time axis scroll bar represent the vertical cursor locations in the record. To position both vertical cursors simultaneously and keeping them at the same distance from each other, press the Ctrl key while dragging a vertical cursor. Horizontal cursors are graph based, they can be positioned anywhere in the graph by dragging them with the mouse. To position both horizontal cursors simultaneously and keeping them at the same distance from each other, press the Shift key while dragging a horizontal cursor. Due to zooming, cursors can become off screen. To position an off screen cursor, it can be grabbed at the edge of the screen. The mouse pointer will change shape to indicate that the cursor can be dragged. Off screen cursors can be positioned inside the screen again by clicking the Cursor reset button which will position all cursors at 25% and 75% of the visible screen. A horizontal and vertical cursor can be positioned simultaneously by dragging the intersection of the two cursors. Using the Ctrl key and/or the Shift key, the other cursors can be positioned as well, maintaining their distance to each other. For clarity, not all measurements are enabled by default when the cursors are enabled. In the program settings ( ) can be determined which measurements are default shown when the cursors are enabled. The cursor window will by default look like in the figure below. The measurements Left, Right, Right-Left, Top, Bottom, Top-Bottom and Slope require the vertical and/or horizontal cursors to be enabled. They use the cursor positions for their result. All other measurements are calculated over a data range. When the vertical cursors are enabled, the data range is marked by the vertical cursors. When the vertical cursors are off, the data range equals the post samples. Besides the calculated values in between the vertical cursors, the positions of the vertical cursors, as well as the difference between them, can be seen at the bottom of the cursor window. The button hides or shows this base info. A user configurable virtual impedance is available that is used by the Power measurement and the dBm measurement . Cicking the mpedance button will allow to set its value. Its default value is 600 Ohm. The measured values can be copied to the clipboard as text, by pressing the button. 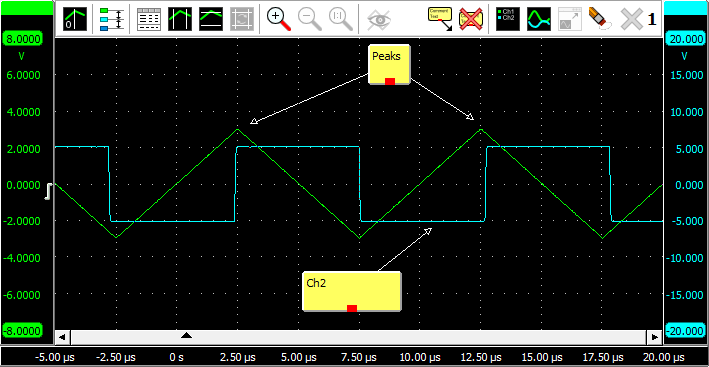 When Always on top is switched on with the button, the cursor window cannot be hidden under other windows of the Multi Channel oscilloscope software. Enabling or disabling measurements can be done by clicking the corresponding measurement buttons on the toolbar, by clicking Select measurements... in the popup menu of the cursor window, or by clicking the button on the toolbar. A window as depicted below will popup, in which the desired measurements can be selected. Note: For the frequency measurement, at least one cycle must be in between the vertical cursors. Furthermore, at least two rising slopes must be present in the signal. You can create a reference to any signal that is displayed in a graph. A reference is a copy of a signal. It is filled and then remains unchanged while measuring. By making such a copy and continuing measuring, you will be able to see differences between the life signal and the reference. References can also be loaded with a "known good" signal of a device, to check life signals against this "known good" signal while troubleshooting a system. You can create a reference by choosing Create reference to → in the popup menu of the graph or one of its axes. 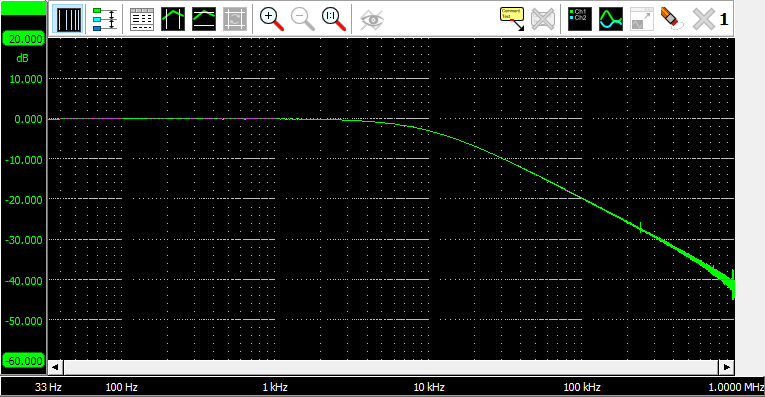 This creates the reference signal and adds it to the same axis as its original. When the reference is created, an "Update reference" button ( ) is added to the graph's toolbar which can be used to copy new data from the life signal into the reference. Multiple references can be made to a signal. References can be temporarily hidden from the graph. The "Show references" button ( ) toggles the visibility of the available references. Sometimes it is clarifying to add a text comment to a graph, to explain certain phenomena in the measured signals. An unlimited amount of comments can be added to each graph and an unlimited amount of arrows can be drawn from each comment to point at the signals. clicking Add comment in the graph's popup menu. The comments can be dragged to the desired position. Arrows can be created by "dragging" from the little square at the middle of the bottom of the comment to the desired position. You can move an existing arrow by dragging its point to a new position. To move a comment including its arrow, press the Ctrl key while dragging the comment. To delete an arrow, right-click on its point and click Delete. A graph with data, comments and cursors can be exported in graphical way to an image file. This is explained on the page on saving images.